Join a group forging through the desert in search of a pyramid, as your skin begins to blister mysteriously away. 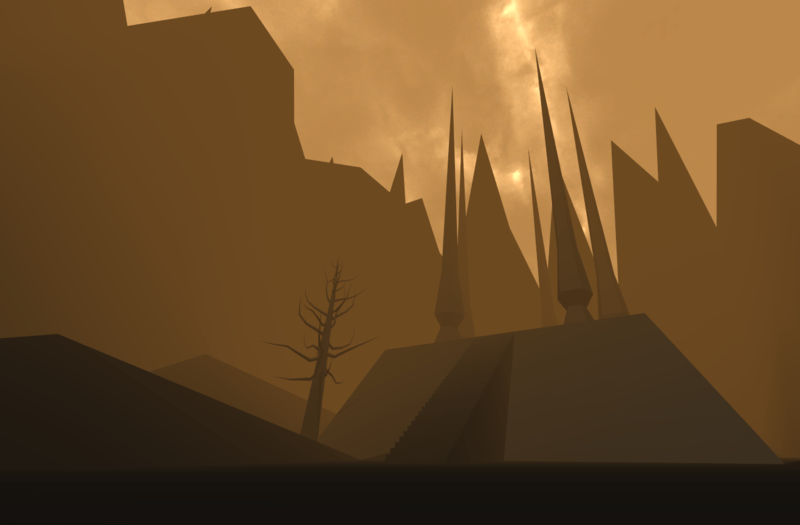 Or explore the ruins of a sigil-painted village as the slick bodies of giant hornets lurk, swollen and sleepy with blood. Wander the suggestion of a mysterious village in continuous rain, urged onward by a pale, sad voice. These are the delicate, expressive horror games of Kitty Horrorshow, whose works have become some of my favorite discoveries of 2015. Most people acquainted with games have specific ideas of what horror looks like—zombie crawls with scarce ammo, visually-dark psychological explorations punctuated by jump scares, or intentionally-clumsy relics dredged from the Japanese console age. Horrorshow's works—most of which can be completed in less than half an hour—feel delicate and literary by comparison. The fact technical sophistication isn't a primary focus makes the spaces she creates feel like abstract art—like the iconic monolith of 2001: A Space Odyssey, forbidding in its plainness. CHYRZA is a slow meditation among blood-colored obelisks that builds dread toward a striking conclusion, and in Hornets Horrorshow draws incredible imagery with her words. 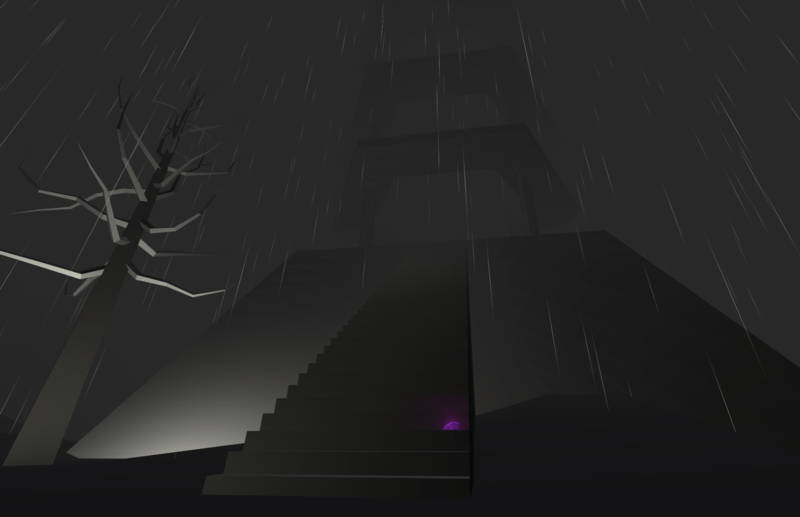 We didn't review the striking Rain, House, Eternity at Offworld, but Kill Screen's Chris Priestman does an excellent job of describing how the restrained, atmospheric game provides a sort of subtle emotional processing, and how it represents an evolution on her earlier portfolio. With each release her works grow in strength and efficacy until they stay with you. If you haven't played any of these games, there's no better time to try—again, you generally need less than an hour, and they are free or pay-what-you-want here. "I feel pretty hollow if I'm not actively working on creating something," Horrorshow tells me. She'd planned to be a writer, but traditional channels had their limits: "I didn't just want to tell stories, I wanted to frame them with whole worlds the player could explore and inhabit." 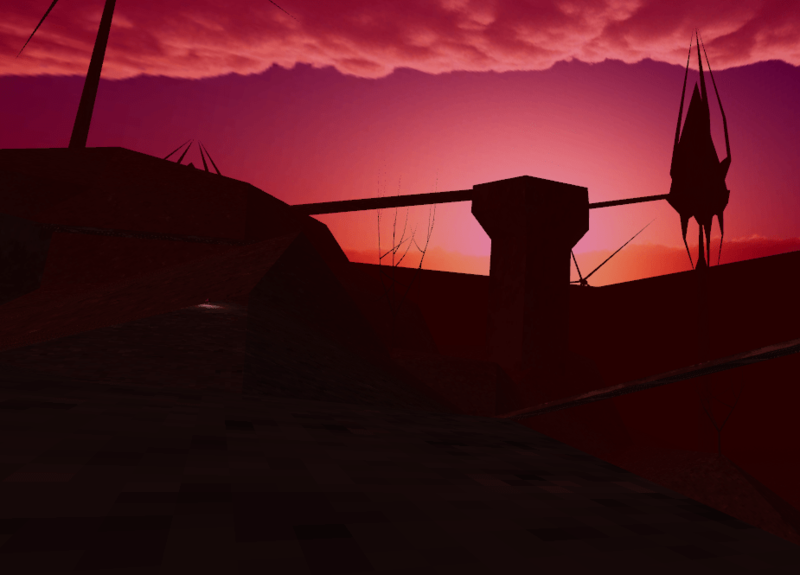 Like many modern independent developers, Twine was a "gateway drug" to the design space for Horrorshow, who grew up with games like Myst, EverQuest, Blood, Doom and Thief among her favorites. "I realized that I got a thousand times more satisfaction from creating environments with stories in them than I ever got from writing linear prose," she says. "Finally I decided to take a shot at making actual first-person 3D games, since I've always loved video games and was always most impressed by the ones that made me feel like I existed somewhere." 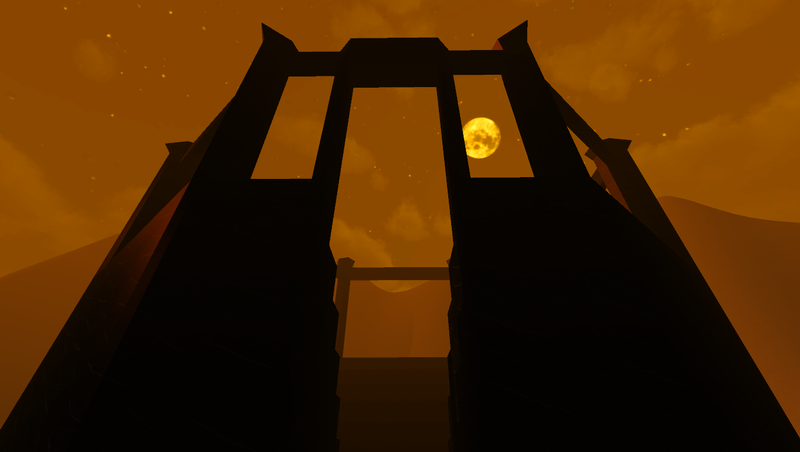 "After a few flailing attempts to learn Unity I started working on the floating temple in Dust City. I imported a really simple column I'd modeled and quickly realized that if I wanted to, I could make it out of glass or marble or crystal or gold, I could make it the size of a skyscraper, I could duplicate it a thousand times. That was pretty much The Moment." Although for Horrorshow game development represents an evolution on linear writing, her writing is still the star of her work—to me, her game worlds feel like ideal vehicles to deliver poetry and prose in new ways. She cites Ray Bradbury, Shirley Jackson, Clive Barker, Clark Ashton Smith, Lord Dunsany, James Tiptree Jr., and Joyce Carol Oates as some influences, as well as Lovecraft ("though not as much as a lot of people think"). "I've spent most of my life being obsessed with Silent Hill, and I still feel like it's more of a home than most places I've ever lived," she says. "I'd be remiss if I didn't mention Porpentine, whose writing is impossible not to be changed by, particularly if the use of language is important to you." "I like to watch Thundercats and daydream about Third Earth, because that show is full of really fun, beautiful, imaginative environments. I read a lot about ancient civilizations, architecture, and the psychology behind things like horror and the uncanny, and that's usually pretty inspiring." Kitty Horrorshow says she explicitly set out to create horror games, which gratifies my own interpretation of her work. "I had fantasies of becoming widely known as some kind of modern Horror Mistress, like the video games answer to Wes Craven or Stephen King," she says. "Anymore though, I try not to lock myself down as much. If I get a story idea that I really love I'll go for it, horror or otherwise. That said, I think I've saturated myself in horror's ideas and motifs for long enough that I'll probably never get away from it completely or very far, which I'm okay with. The bottom line is I really want to create stories that are fantastical and that inspire wonder. Whether or not they do so by being frightening, I figure out at the time." If there can be said to be a unifying feature about her works, it's the way they all feel like mysteries—what motivates me through her strange and occasionally-surreal worlds is the desire to find out what happened, is happening, will happen. One of the common problems with popular horror is "the ending"—when to reveal a twist, how to conclude the experience thereafter—and I love the structural elegance with which Horrorshow tackles this challenge. I suppose I sort of start with the answer and work backwards. When I have ideas, they're usually very broad and blunt ('A huge pyramid shows up in a desert and starts being a jerk')," she says. "As the writer I already know what's happening when the game begins, so as the game designer my job becomes imagining the player's starting perspective and figuring out how to portion out the information that eventually leads to their understanding." "Luckily for me, this usually isn't much harder than just writing a short story and then dividing it up into a paragraph or two at a time, and as long as the story's properly paced things work out okay," she says. "Every portion just needs to contain one more step, one additional idea or puzzle piece that will eventually paint the whole picture... 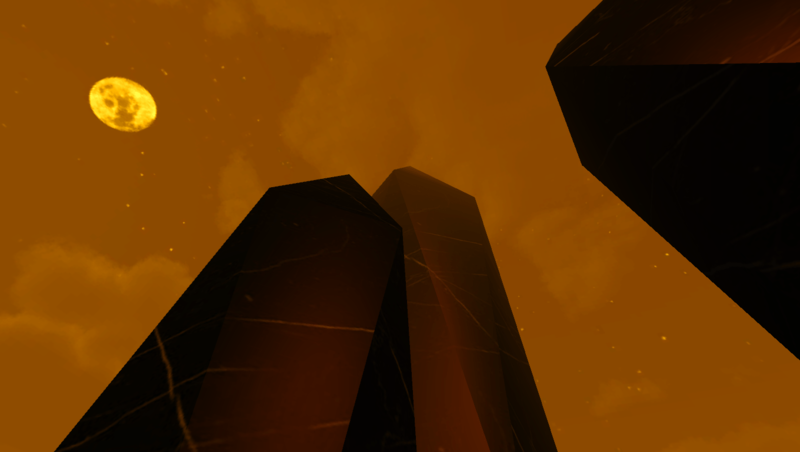 I imagine I'm creating some kind of ruin or archaeological site that the player's visiting, but then try to work the player into the story of the place somehow, so that they're connected to the setting rather than just a visitor." The larger themes I've divined from the games I have played—thoughts on faith, community, depression—are "largely accidental", says Horrorshow, who says she never goes into creating something with the intention to deliver a "message or moral." "That said, I like to think there's an element of subconscious deliberation at work, because a lot of the time I'll get half-way through making a game, and then suddenly its 'meaning' will dawn on me," she says. "I like this approach because a lot of the time it's cathartic and surprising. I didn't realize what Rain, House, Eternity was really about until I had nearly finished it, and it was a powerful, deeply personal moment for me, and it also allowed me to make an ending that was much more appropriate than what I'd planned." Kitty Horrorshow is currently working on a haunted house story ("haunted houses are my all-time favorite horror idea)" presently titled Anatomy, which she hopes to release for Halloween. She also plans to collaborate with ceMelusine (another Offworld favorite creator) on a project she suggests horror fans will like. Her work is funded via Patreon, and she's just begun focusing on games full-time, so financial support will help to nurture and sustain Kitty Horrorshow's amazing continued works. Visit her page here and consider becoming a patron. Almost all of her games are available for free or pay-what-you-want from her digital storefront here.